The dawn of the Cold War marked a new stage of complex U.S. foreign policy involvement in the Middle East. More recently, globalization and the region’s ongoing conflicts and political violence have led to the U.S. being more politically, economically, and militarily enmeshed – for better or worse—throughout the region. This book examines the emergence and development of U.S. foreign policy toward the Middle East from the early 1900s to the present. With contributions from some of the world’s leading scholars, it takes a fresh, interdisciplinary, and insightful look into the many antecedents that led to current U.S. foreign policy. 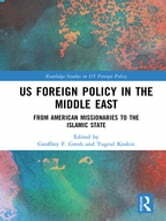 Exploring the historical challenges, regional alliances, rapid political change, economic interests, domestic politics, and other sources of regional instability, this volume comprises critical analysis from Iranian, Turkish, Israeli, American, and Arab perspectives to provide a comprehensive examination of the evolution and transformation of U.S. foreign policy toward the Middle East. This volume is an important resource for scholars and students working in the fields of Political Science, Sociology, International Relations, Islamic, Turkish, Iranian, Arab, and Israeli Studies. The Relationship Between Islamism and Women in Civil Society: A Look at Turkey and Egypt - Muslims, Tanzimat Reforms, Kemalism, Islamist Faction, Sadat, Mubarak, Arab Spring, What About the Veil?